This playful block of the month is another design from Sindy Rodenmayer. 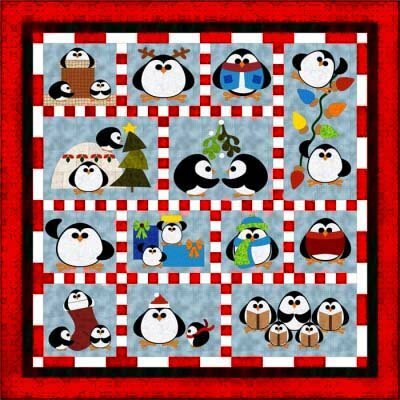 There are 13 applique blocks featuring bright colored penguins. Over a 7-month period you will receive pattern, background fabric, pre-cut & pre-fused laser applique pieces, sashing, borders and binding. The finished quilt measures 76" x 76". There is a $ 10 non-refundable registration fee, then $ 29.00 per month including free domestic shipping and handling for each kit. The fabrics will be matched as closely as possible to the picture. Some substitutions may occur due to availability.